Since I have been in design for about 20 years now, I have seen a lot of colors go in and out of style. But when talking about neutrals, not much has changed at all. Such as the colors below that are as popular now as 20 years ago. Even after all these years, 95% of the time, color experts still go straight to Ben Moore’s Historical Colors. Why? Because they have proven over time to be colors that are a collection of time-honored hues comprising their most popular palette. Steeped in tradition, the refined, elegant colors of the Historical Collection deliver timeless color that can be used in traditional as well as contemporary spaces. Many designers go right to the historical collection also because although we have played with and experimented many different colors, the collection has proven over and over to be winning colors voted for and used by many. Why? Because they provide good backgrounds and serve to unify diverse color palettes. Neutral colors help to put the focus on other colors or serve to tone down colors that might otherwise be overpowering on their own. See how in the photo above, the fireplace is the focus in the room? This is an example of how a neutral background works best by not competing with the main colors of the room. In my post about my favorite neutral colors here, all of my favorite neutrals were pulled from the historical collection. In my article ‘Top Selling BM paint Colors for 2010, most all colors are also from the same historical collection. So next time you begin searching for that perfect neutral color for your home, take a look at Ben Moore’s Historical Colors first knowing that they are proven winners and used by many experts. Do you have a favorite neutral color you want to share with us? If you need help making your home happy and comfortable, contact me. I always tell clients when using a really great, bold wall color, do not panic while painting or looking at it right after you finish. The color will be popping right off the wall, in your face, seeming to be so loud and obnoxious! I tell them that the wall is still naked! There is nothing against it yet. Do not forget, the color you picked for your walls should be the background for all of your furnishings. Your sofa, chair, table, window treatments, art and accessories will be highlighted and be the ‘stars’ of the room. So, next my wonderful husband painted the wall with that great color green I told you about here, Winding Vines. Now, I had no furniture or pictures or anything against the wall yet, but when I stood back and looked, I absolutely panicked! But if you know me, sometimes I over obsess about trying to get things perfect. All I could see when I looked at the wall was how the Winding Vines green was not working with the pool table green. Maybe if I had taken my own advice and tried the color on the wall first, I would not have run into trouble again. Be sure to sample the color before you paint! I could not get past it and wanted it changed again. That is when I decided to give wallpaper another shot ( a few years after I said never will I ever use wallpaper again in this lifetime). Again, refer here. OMG!! It is so bright! I do not like at all! Again, panic city. But then I start to put my furniture back in place. 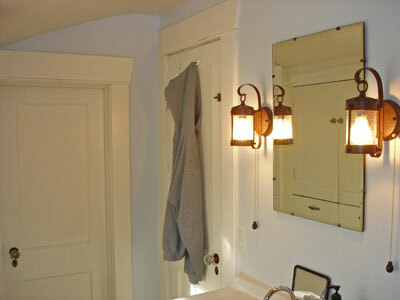 Sconces go on the wall first, then a large mirror is hung. Well, maybe it is not looking so bad now. Next, I place my console table in the middle of wall and decorate with accessories. Wow– I guess it doesn’t look so bad after all. Actually, I love it! Glad I went with the bold. So, please use those bold colors you love, just try not to panic before you put your furnishings back in place. If you do panic, know you are not alone. It is very natural to feel this way, but remember, you still have to dress the wall. If you did not pick the wall color according to your furnishings, and started with the wall color first, (which I will have to do a post on that ) know that eventually you will have a finished room. Did you notice that fanastic mirror? That is the one I told you I bought in my blog about mirrors here. If you need help and encouragement on your next decorating project, call me at 401.765.7999 or email [email protected]. “Green is the prime color of the world, and that from which its loveliness arises.” –Pedro Calderon de la Barca, Spanish Poet and Playwright, 1600-1681. I love the color green as a neutral. How can it not be the perfect neutral when in nature it works perfect with so many different colors? First, Ben Moore Winding Vines, # 532. Of course, the color looks nothing like this computer sample. Actually, when I first looked at it in the color fan, I thought it was so dark. But when I put on the walls- excellent! This is another good example of how important it is to buy that sample jar to try out in your home, with your own lighting, instead of just judging (and guessing) at your paint selection by that tiny little color card. Love this color with orange! (excuse the glare in photo). I suggested the color to a client- she loved it! Here is a picture from herdining room in the Winding Vines. See how well it works with so many colors? It really looks great with the black. Another green I fell in love with is Ben Moore Hillside Green # 495. My client wanted a sage green for her walls to match fabric that we were using to slip cover her sofa. Again- a very bad representation of actual color. I always make sure my clients take a paint sample home to try in their home with their lighting. The store did not have a small sample, $4.99, of the Hillside Green so I bought a pint size sample for $6.99. I painted a large poster board to use as a sample. I can not stress it enough- to save yourself a lot of trouble and disappointment, sample the paint on a large surface at home. You will also save yourself money by not purchasing an entire gallon of color that you end up hating. I really love the softness of the color. I will take pictures and post for you after the room is painted. Do you have any great green paint colors you have used and want to share? If you need help choosing paint colors to make your home happy and comfortable, write Kelly or call 401.765.7999. Would you consider these items outdated or vintage? Number Ten: Outdated window treatments. I really do not want to hurt any one’s feelings, I am just trying to help! Really! Number 9: Paint colors no longer in fashion. I do not know which is worse, the dreadful faux gold paint on the cabinets or the fake fruit in the bowl. I remember my mom having that fake fruit on the counter. Number Eight: Big brass chandeliers. I offered advice here on how to update your brass lighting. Do it. If you hold out a little longer, they will probably be back in style. Did you hear people are getting tired of the stainless steel look? Number Six- Paneled Walls. The gentleman is extra on me. Number Five: Old fashioned wallpaper. Number Four: Dated bathroom light fixtures. These were not the worst light fixtures in a bathroom I have seen. Believe me. Number Three: Fake looking plastic flowers. Oh, don’t even get me started! This one really bugs me. Do people seriously think others will be fooled into thinking they are real? Number Two: Peeling linoleum floors! Please do yourself a favor and get rid of them. If they are sentimental- keep them in a drawer where you can see them but no one else can. So there is my top ten list of out of vogue items. I might have to start another list because what about macrame plant hangers? Obsolete ashtrays? I would not consider any of these items vintage. They are just ‘out’ in the design world today. If you need advice and encouragement to help you update your home, call me 401-765-7999 or email for more information [email protected].